Save money and stay in comfort. Our good sized 4 bed dorms are generally the same price of a 8-10 share dorm in other backpackers. Located just a short walk from Kings Cross, Sydney Opera House and the City Centre, Australian Backpackers is the perfect place to stay for your Sydney adventure. 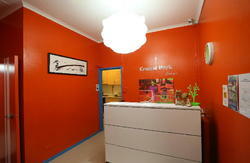 The Australian Backpackers is small and friendly budget accommodation with the best city views, staff and facilities. Along as being the best place to watch a Sydney sunset our roof terrace is a great place to relax and socialise with other backpackers. We also have entertainment (wine & cheese, BBQ's) on there, if we are not taking you out to the best bars and clubs in Sydney (drinks sometimes included). 2. Once at kings Cross exit the station via Darlinghurst rd. 3. Turn right then walk for 100 metres to William St.
4. Turn right on William St and walk 400 meters down the hill to Bourke St.
1. Head to the middle of Hyde Park and walk along Park st which turns into William st.
2. After approximately 750metres turn left onto Bourke St.
3. Turn left onto Bourke St, we are 50 metres on the right.